"It's not a good time for feelings. But that suits me." Prolific German director Rainer Werner Fassbinder became interested in the paradoxical conduct of his countrymen during the years shortly after World War II. The "economic miracle" that was wrought as West Germans recovered from the disasters of war were not without psychic costs, as the influence of American soldiers and the desire to survive combined with a calculated forgetfulness about the past few decades. These three films, which along with Berlin Alexanderplatz were among Fassbinder's last works, together look at these years by the examination of the lives of three highly distinctive women. In his most financially successful picture, Fassbinder takes a look at a survivor who is willing to take almost any step in order to both assure that survival, and to maintain her cherished illusions. The film opens on the wedding of Maria (Hanna Schygulla) to Hermann Braun (Klaus Löwitsch) during a bombing raid; within a day after the hall explodes, Hermann heads off to war, and he is soon presumed to be dead. Maria nonetheless plagues the train station looking longingly for sight or a word about her all-too-brief spouse. Steeling herself, she uses barter to get a fine dress with which she can infiltrate the GI club. Hooking up with a black sergeant, Bill (George Byrd), Maria begins a sexual relationship that she never very well consummated with her husband. At that inopportune moment, Hermann resurfaces and when Bill ends up dead, the husband takes the rap and goes to prison. Carrying the memory of her wedding, Maria takes further steps that she at least thinks are in the best interests of her marriage. One of the most overtly political of the films in the trilogy, Maria Braun features a running commentary of political speeches on a variety topics by Konrad Adenauer, interlaced with highly enthusiastic soccer reportage. Maria is essentially a metaphor for Germany, struggling to survive and willing to do just about everything (though as a point of pride stopping just short of actual prostitution). The mental image of what the recovered nation should be is the equivalent of Maria's delusions about her fragment of a marriage; once she has to deal with the reality, things quickly fall apart. If we missed the point, Fassbinder bookends the picture with a photo of Hitler at the start, and portraits of Adenauer and other German leaders at the very end. But in addition to metaphor, the film also works well as straightforward human drama, as Maria becomes the logical extension of Scarlett O'Hara. Her conflicting attitudes toward Hermann are underlined by her desire to keep the memory of her marriage sacred, while at the same time she flaunts her sexuality and infidelity before her imprisoned husband. The German word traurig (roughly, sad) repeatedly crops up in the dialogue, both in the foreground and the background, as a counterpoint to Maria's bland cheerfulness as she secures work for her company through her sexuality. The dehumanization she is undergoing is emphasized by the clatter of an adding machine, and her uncomfortableness with genuine emotion is betrayed by her severe discomfort with her mother's sexuality. Schygulla gives a determined performance, with her rather doughy face keeping her not all that far away from the stereotypical dumpy hausfrau, despite her efforts to present a more sophisticated air. Löwitsch primarily gives a stoic performance that is almost impenetrable in its quietness, broken only at the very end, which is suspenseful but also carries an air of tragic inevitability. Whether the final disasters are intentional or accidental is a matter left completely ambiguous by Fassbinder, giving the picture a memorable and thought-provoking conclusion. Although we see and learn little about Maria Braun from before the end of the war, a bit more is learned about the past of the title character of the second film in the trilogy. The last to be released, it was also the final film completed by Fassbinder before his untimely 1982 death. Voss (Rosel Zech) is a faded UFA star from before and during the war who denies that she had any connection to the Nazis. A chance 1955 meeting in the rain with sportswriter Robert Krohn (Hilmar Thate) leads to the man developing an obsession with the actress. But there are complications, and not just because of his live-in lover Henriette (Cornelia Froboess), but the odd relationship that Voss has with dominating neurologist Marianne Katz (Cornelia Froboess). The good doctor is supplying Veronika with illegal quantities of morphine, and the more that Krohn looks into the situation, the less savory the underbelly becomes. Sunset Boulevard looms large over this picture; Veronika isn't quite Norma Desmond yet, but she's clearly well on the way to dementia as she loses herself in memories of her past (presumably during the Nazi regime, though no Nazis ever appear onscreen), and her marriage to Max (Armin Mueller-Stahl), a nod to von Stroheim's character in the Wilder film. The obsession with the film diva and struggle with the young woman is also repeated here, though all to very different effect. The period character is emphasized by the use of black-and-white stock as well as irises, dissolves, and wipes that are imaginative variants on mid-century filming styles. In stark contrast to survivor Maria Braun, Veronika Voss is clearly doomed; the only question is how many people she will take down with her on her descent into the abyss. A tragic figure looking to both relive past glories and paper over her past with Goebbels, her relationships with others are thoroughly dysfunctional. Krohn and Max both act as mere caretakers; after Krohn and Veronika make love, she assumes a fetal position as her memories flood over her, and when she recovers she has no idea who he is. An encounter with a fan in a jewelry store quickly turns from ego-boosting to threatening as the fan reminds the star of a forgotten autograph request from years ago, as she moves antagonistically toward the camera. But the most dysfunctional relationship is clearly that with the sinister Dr. Katz, who thoroughly manipulates and terrorizes her charge with both the drugs and psychological abuse. Veronika Voss is loosely based on German star Sybille Schmitz, who died mysteriously on Easter weekend of 1955. Thate is excellent as a Bob Hoskins sort of character that is plainly way over his head in this situation. Zech (who was an acclaimed stage actress specializing in Ibsen) is similarly fine as the talented actress who still has flashes of her old brilliance, though now few and far between. Fassbinder uses music to particularly good effect here, with several songs providing a thematic connection as they run throughout the picture: Dean Martin's Memories Are Made of This, the Johnny Horton hit The Battle of New Orleans, and Tennessee Ernie Ford's Sixteen Ton ("I owe my soul to the company store" slyly becomes I lost my soul in the words of another addicted patient of Dr. Katz). Melancholy, bittersweet, and moving, the film successfully takes the rather unsympathetic Voss and, through Krohn, helps disclose the humanity that is living beneath the lie, again being utilized as a metaphor for 1955 Germany. The concluding chapter in the trilogy (actually the second shot) is based loosely on the same Heinrich Mann novel that formed the basis of The Blue Angel. But instead of looking at the seduction and ruination of a respectable man in the days of the rise of the Nazi party, Fassbinder transplants elements of the story to the years after the Nazis were crushed. Herr von Bohm (Armin Mueller Stahl) is the new building commissioner in a city plagued with corruption, especially the wealthy developer Schuckart (Mario Adorf), who keeps Lola (Barbara Sukowa), a cabaret singer of dubious morals. Lola has her sights set on buying the brothel where she works, and she exercises her wiles to bring this about. Challenged by Schuckert on a bet to try to seduce von Bohm, Lola gets to know the strait-laced man and, posing as a repressed intellectual herself, develops a relationship with him that becomes increasingly one-sided as von Bohm grows increasingly obsessed. 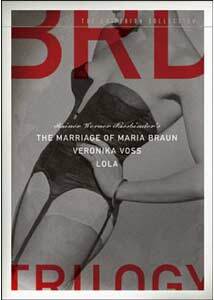 Lola is willing to take the step that Maria Braun is not; yet she is not, by far, the least moral character in the piece. Schuckert and his power elite are grasping and corrupt through and through, and von Bohm tries vainly to oppose them; when he learns of the truth behind Lola his resistance stiffens, then tries other routes. But inevitably he must face a humiliation, even though it is in the guise of a happy ending. The denouement, though fully as humiliating, is less extreme than in the Dietrich-Jannings picture, with von Bohm not descending into quite the depraved depths that Jannings' Professor Rath willingly dives. Yet the more low-key embarrassments suffered by von Bohm are for that reason all the more powerful. Sukowa's Lola is rather impenetrable; while at times it seems that she may really be falling in love with von Bohm herself, her actions toward the end seem to take a far more cynical attitude. Tying this together with the other two, in addition to the thematic material, is the presence of Gülnther Kaufmann as a black GI; it's not clear whether he's meant to be the same character in all three pictures, threading as a tangential character in all three womens' lives, but there doesn't seem to be any reason to conclude that he's not the same character. This third part is not quite as moving as the first two installments, but it does fit coherently together with them. Although Fassbinder has a reputation for being inaccessible and austere, these three films are highly emotional and much more accessible than their reputation would imply. Image Transfer Review: The films are given anamorphic transfers, though there seem to be some oddities in the anamorphic encoding. The first and third films are supposedly 1.66:1, with the middle chapter at an aspect ratio of 1.78:1. But on my Sony player, they all are exactly the same size (1.78:1, with no black bars at all), even after removing all overscan. However, on DVD/ROM they play more or less in the correct ratios. In any event, they look rather good, though substantial grain is present, presumably from the originals. The prints are quite clean, but rather soft and lacking in fine detail much of the time. Closeups, however, have extreme fine detail, which causes me to suspect that the softness is a component of the filming style. There is significant edge enhancement present much of the time, and occasionally the framing is unstable, with telecine wobble on display and a severe shake late in Maria Braun. Lola displays brilliant, almost psychedelic, colors. There is a good deal of video noise on complex patterns, such as von Bohm's houndstooth-check jacket. Veronika Voss has very high contrast with blown-out whites, but as cinematographer Xaver Schwarzenberger indicates in the extras, this was intentional, as are the blinding colors in Lola, which serve as a parody of three-strip Technicolor. The main problem is the edge enhancement, which at times distracts by creating haloes around character. Audio Transfer Review: All three films are presented with their original 1.0 mono German tracks. Hiss is prominent, especially on Maria Braun, but other noise and crackle is mercifully limited. Dialogue is generally quite clear and clean, and the music scores have decent depth and presence, without much of a tinny quality. The extent to which the soundtracks have been cleaned up is demonstrated vividly by the even more hissy and noisy clips contained in the documentaries. Extras Review: The trilogy is given a set of full-length commentaries, with different participants for each film. Maria Braun features cinematographer Michael Ballhaus and director Wim Wenders. Neither speaks English as a first language, and making out their discussions is difficult; worse, their speaking voices are complete monotones and the result is painfully sleep-inducing. Less dry and far more interesting is critic Tony Rayns' discussion of Veronika Voss, which touches on Sybille Schmitz' career as well as the vivid techniques used by Fassbinder and thematic elements. Lola is commented upon by Danish director and friend of Fassbinder, Christian Braad Thomsen, who struggles with English far less than Wenders and thus is much more listenable. He has plenty of interesting stories about Fassbinder and the regular collaborators populating his cinema repertory company. Each disc of the three films contains valuable and substantial interview materials, all of them newly recorded in 2003. The Maria Braun disc features Schygulla (31m:57s), who reminisces about many of her films with Fassbinder (20 in all) and her relationship with him. Film professor Eric Rentschler (19m:52s) discusses the influences on the film, including Mildred Pierce, with emphasis on the desire of Germany to forget at all costs. For Veronika Voss a dual interview (31m:18s) with Rosel Zech and film editor Juliane Lorenz is a confident and informal chat that is highly enjoyable. Barbara Sukowa (19m:43s) speaks (in English) about Lola and her approach to the role; she makes some particularly striking comments about the damage on the German psyche brought about by the dual burden of guilt for their conduct during the Nazi era, and at the same time (and for the same reason) being unable to properly mourn for their own dead. Finally, Peter Märthesheimer, who wrote the screenplays for all three films, speaks about them (33m:06s). This makes for an excellent unifying overview of the trilogy, not to mention being entertaining when he laughingly describes how he was cheated out of his share of the profits on Maria Braun, rashly promised to him by the producer who later claimed insanity! Finally, he touches on Fassbinder's final project, the never-filmed Rosa Luxemburg. The Veronika Voss disc also includes a powerful documentary about Sybille Schmitz, Tanz mit dem Tod (Dance with Death), running 55m:16s. Directed by Achim Podak, this television production looks backward from Schmitz's apparent suicide to look at her career, from its beginnings as the raped housemaid in Diary of a Lost Girl and Dreyer's Vampyr (1932), through her dismal postwar career and drug addiction. Copious clips and stills are used to make a point, with the central theme being the odd fascination with death that seems to run through nearly all of her screen roles, giving her death a feeling of being preordained. Not only are there copious extras on the disc for each film, but there's an entire disc devoted to bonus materials. Another interview with Juliane Lorenz (32m:39s) centers expressly on Fassbinder's editing style, frequently working without rushes but immediately editing scenes as they were filmed. She also touches on the casting of the trilogy and reveals that at one point Schygulla was intended to play all three of the women; however, when she revealed this in an interview Fassbinder flew into a rage and that was the end of that idea. A second interview segment with Xaver Schwarzenberger, cinematographer for Fassbinder's last five projects (including the last two films of the trilogy) gives some interesting insights into Fassbinder's shooting process, backed up by behind-the-scenes footage. Fassbinder controlled the framing absolutely, but left the lighting and color filters to his cameraman, which left Schwarzenberger a good deal of room for creativity. More substantial is the 1993 documentary Ich will nicht nur, dass ihr mich Liebt (I Don't Just Want You to Love Me), directed by Hans Günther Pflaum. This lengthy film (1h:36m:32s) consists mostly of interview footage of Fassbinder's collaborators with a few select clips from films. There's also a good analysis of Fassbinder's visual language here. Although one doesn't really get a very clear sense of Fassbinder, one notion that does come across is that he was a compulsive filmmaker; unlike the others who fall into that category, such as Jess Franco and Ed Wood, however, his pictures were often very high quality despite low budgets and short shooting schedules. This thought is backed up by the longest (48m:24s) interview with Fassbinder ever filmed. At first inarticulate and reluctant to talk, Fassbinder warms up a bit about 15 minutes in, though the questions become a bit irritatingly abstract and Fassbinder visually seems to be wondering where this discussion is going. One is left with the inevitable comparison to Franz Schubert, madly creating before his impending premature death. The question is unresolved, however, as to whether the creative burst was to accomplish as much as possible prior to an early death, or whether that death was brought on by the frenetic pace of work. Of course, Fassbinder's chain smoking probably didn't do his bad heart any good either. Except as noted, everything but the commentaries is in English-subtitled German. A set of trailers, one for each film is included, though for some reason that for Veronika Voss is not anamorphic. Last of all, a 52-page book contains extensive written essays, copious photos, and a full listing of credits for each film. Fassbinder's powerful trilogy of the lives of three women in postwar Germany is given an excellent presentation by Criterion, with a ton of valuable extras to boot. Highly recommended.